One of the most exciting things about technology is what it offers us for digital storytelling. 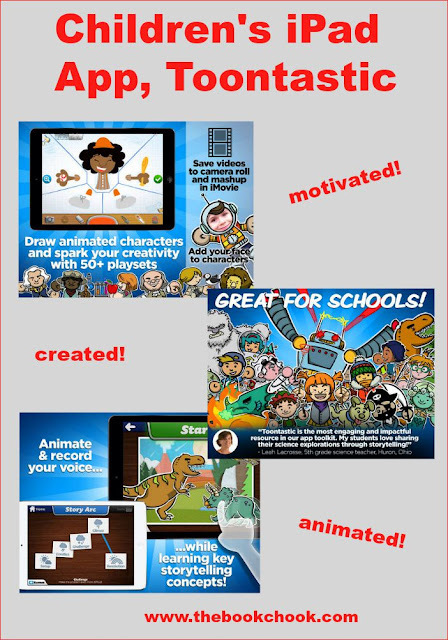 Toontastic is an app that encourages children to make stories by using animation. You can find other tools for digital storytelling in Creating Digital Stories with iPad. - Hundreds of Characters and Backgrounds: Ignite your family’s imaginations with 50 playsets chock full of pirates, princesses, and far away galaxies. - Video Export: Save videos to the Camera Roll to post online or edit in iMovie. - Toy Camera: Take and import photo backgrounds to turn your playroom into a movie studio and add your own photo faces to characters. - ProtoToys: Draw your own animated characters complete with rocket boosters, helicopter blades, flying capes, and more animated effects. Their story results in a video that consists of visuals and audio. The visuals come from animation of characters, either pre-made or drawn by kids themselves. The audio is a combination of children recording their own voices, and music supplied by the app. Along the way there’s so much great detail. Kids will love the humour of things like their movie being presented in a theatre setting, with a Columbia style introduction and the advice that no monkeys were harmed during the making of the movie. I know that teachers and parents will appreciate the many many opportunities for children to create and edit their own stories. Sharing is easy, with the video being saved to the camera roll, and the possibility of exporting from there. What’s even more amazing than the quality of this app, is its price - free! Don’t hesitate to grab this one for your kids - they’ll relish the chance to create and have fun when it’s screen time. Recommended for kids from 5+. Check out my other iPad App Reviews on Pinterest. You'll also find my app reviews on Listly.